If my experience creating a mix for this is any indication, this was a particularly challenging project for the DJs in the line-up. Because this party is “virtual”, we don’t have the advantage of hearing the tracks that the DJs before us have played. We chose as a group not to share our tracklists with each other, thereby preserving the experience of also being a dancer at a real-life party, not knowing what the DJ will throw on next. As such, the chance for dupes goes up – you may hear the repeating of a track here or there throughout. Also, we have no clue as to what track or what vibe the previous DJ has left for us when we go on. Normally, one is able to feed off of the previous DJ’s last few tracks and the state of the dancefloor to determine how you’ll start your set. In this case it’s “Pick tracks and set the flow for your set according your timeslot.” How well the sets flow between each other will be one of the most fun things for me to discover when I first listen to them. Then there’s the whole 90-minute set thing. In general, going for 90 minutes without a hiccup is more difficult than the standard 74-80 minute mix length appropriate for burning to CD – there’s just more of a chance for a fsck up. However, live sets often have more character than studio mixes for this very reason, so if you listen to these mixes while keeping in mind the environ in which they are to have taken place – at a party – I think it’ll make for some seriously awesome stompitude. OK, that’s enough random spewage from me for now. Stay tuned for another update (or maybe even a post with all of the mixes) in the near future. I’ve got file renaming, ID3 tagging, uploading, and various other production tasks ahead of me, as well as that last mix to obtain. 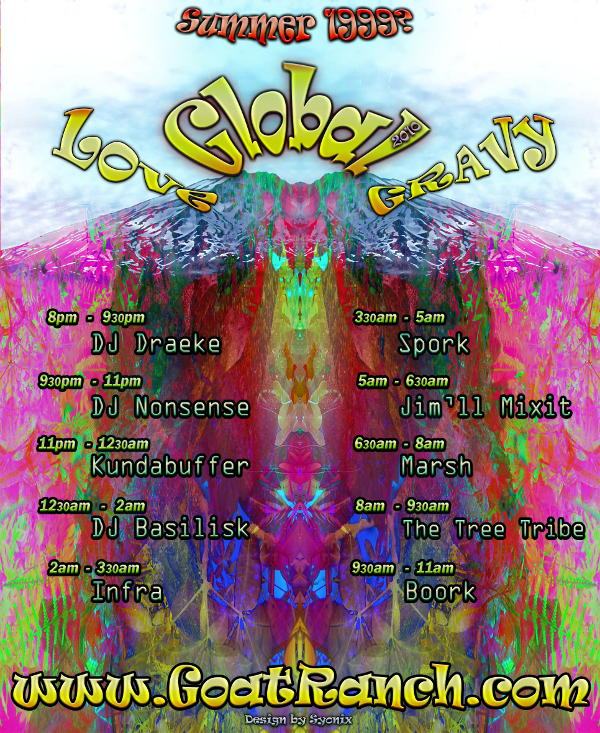 ← Global Goa Party – soon now!